Test your creative flair. Can you architect a perfume to meet your client's brief? Can you blend elegance with strength, beauty with lasting appeal. 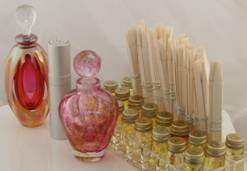 Create perfumes that will set the world alight? Will your fragrance be heralded as a Grand Design? In this game each team is asked to be the “Perfumer”, the “Nose” and meet the fragrance design briefs. Three very different briefs, some more strict than others, how far do you push the boundaries yet stay within the lines? Each team will design then blend their perfumes. They then must sell them to the panel of judges who will decide which team has best matched the briefs and won the deal. Consultants are on hand to help with the blending and provide some basic blending advice. Teams will be provided with a blending kit, briefs and game cards.